This expanded LARG includes the following items: A Tenant's Thoughts on the Office Repairs Clause, The Office Tenant's Check List for the Repairs Clause, The Pro-Tenant Office Building Repairs Clause, and The Restoration Clause and the Spurned Landlord. The Lease Clause Critique analyzes five clauses dealing with tenant improvements and personal property. As with most other things in life, the repair duties of the office tenant are negotiable. Such obligations are very much worth careful attention by the tenant, since many repairs cost lots of money, especially those to structural elements of the building, roofs, utility facilities, or heating, ventilating, and air conditioning (HVAC) systems. And just getting a specific item excluded from his duties under the repair clause does not necessarily constitute a complete victory for the tenant. The tenant may still pay for the repair as an operating cost, even though the landlord agrees to make it. Single Tenant or Multi-Tenant Building? Just what should be included in the tenant's repair obligations in a multi-tenant office building? As a rule, only nonstructural repairs within the premises. The landlord normally is responsible for structural repairs, even if they are located within the premises. The tenant in a multi-tenant building rarely has responsibility to perform repairs outside of the premises, unless they were necessitated by the tenant's negligence or willful misconduct, or by that of its employees or agents. In a multi-tenant building, the landlord generally performs a more active repair and management function for the building, since no single tenant could be reasonably expected to bear the burden of repairs that would be required for the entire building (e.g., the HVAC system). In single tenant office building leases, the tenant's scope of repair obligations is usually greater than the repair obligation of a tenant in a multi-tenant office building. With only one tenant in the building, both the landlord and the tenant expect the tenant to bear more responsibility for necessary repairs (that is, some types of necessary repairs, the tenant reminds us). This makes sense because the tenant will occupy the entire building (i.e., the whole building will be included in the definition of the tenant's premises), and since the tenant will have its own on-site maintenance personnel. Who Fixes It—And Who Pays? If the landlord performs the particular repair item, he may insist that the cost of the repair be included in the operating costs paid by the office building tenants on a pro-rata basis. 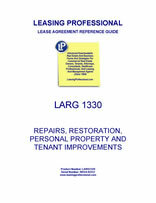 It is one thing to get the item excluded from the tenant's repair obligations. It is quite another to get it excluded from the tenant's repair obligations, and also excluded as an operating expense paid by the tenants on a pro-rata basis. Of course, payment of a pro-rata portion of the repair is better than paying for the entire item. And the tenant may have better luck persuading the landlord to exclude the cost of certain repairs performed by the landlord from only its (i.e., that particular tenant's) pro-rata share of operating costs. The landlord can still try to collect the cost of that repair from the other tenants in the building. The tenant may have more success in excluding certain repairs (both from the tenant's repair duties and from inclusion in building operating costs) than others. Despite the office landlord's tendency to throw everything but the kitchen sink in as a building operating cost in the lease, some items do have a more aromatic presence there than others. For example, asking the tenants to pay for structural repairs to the building as an operating cost is not something most landlords like to do in a loud voice. They may bury the item in two pages of “...including but not limited to...” language in the operating costs section of the lease, but, if asked, they will usually take it out. Likewise for capital improvements. After all, the office building itself is the capital improvement for which the tenant is paying the monthly rent, isn't it? And then there are the many other clauses under the lease that can alter, change or affect the provisions of the repair clause. Like the alterations clause that governs tenant alterations to the premises. Or the casualty clause, that covers reconstruction and insurance associated with a casualty or destruction of the premises or building. Or the building services clause that sets out the landlord's obligations with respect to the services for the building that the landlord must provide. Or the clause pertaining to compliance with governmental orders that can require the tenant to comply, at its expense, with governmental orders or laws that affect the premises during the term of the lease? All these provisions must be harmonized and made consistent, so that a victory in the repairs clause by the tenant will not be negated elsewhere in the documentation. Another area of major concern for the tenant is any tenant obligation to restore the premises to their original condition at the end of the term. Such obligations can appear as part of the repairs clause, although they are also frequently contained in the alterations clause of the lease, or elsewhere. They are bad news for a tenant that is moving out of the premises at the end of its lease term. Such provisions require the tenant to restore the premises to their original condition (i.e., to the condition in which they were delivered to the tenant initially), less reasonable wear and tear. In some cases, the landlord has an election to require the tenant to restore. If he notifies the tenant within a certain period of time near the expiration of the term, the tenant is obligated to return the premises to their original condition. Restoration can cost big money, and is akin, in the tenant's view, to buying a fur coat for its divorced wife, since it involves making major outlays for space that the tenant is vacating. What's worse, if the tenant is leasing new space to replace its old premises, the tenant needs cash for tenant improvements to its new premises. The last thing it needs is to be required to spend that cash to restore its old space to its former condition. Smart landlords know that getting a restoration clause in the lease will give them substantial extra leverage at the end of the term, which can be especially useful if its relationship with the vacating tenant is strained. It's a card any landlord likes to have in its hand at the end of the term, and something savvy tenants studiously avoid. The following items should be considered by the office tenant when repair obligations are negotiated. Of course, much depends upon whether the tenant takes the entire building, or is one of many tenants occupying the building. And, as noted above, it may be appropriate to exclude an item from the tenant's repair duties, but to nevertheless include the landlord's cost of performing the repair in the tenant's pro-rata share of operating costs.